Ego’s postman may deliver to ‘88 Surrey Street’ but to make this easy, Ego is essentially a restaurant built into the Winter Gardens. Ego has a unique location and it makes the most of it, with plenty of glass walls offering fantastic views of the tropical plants inside the Winter Gardens. The interior continues the plant-life theme: the mirrors in the bar area are embossed with a stylised branch print and there’s a very artistic silver tree with copper leaves in the dining area. The restaurant is strictly open plan, with no cubbyholes for those after an intimate meal, but this is part of Ego’s charm, which is all about glass walls and open spaces, and giving everyone a chance to admire the fantastic view. With its exposed faux-rustic beams, artistic decor and shiny glass at every turn, Ego certainly creates an impact. We were escorted to a table in the corner of the spacious dining room and were immediately brought a jug of ice water, complete with very swanky, blue-tinged water glasses. So far, so good. The menu may have a Mediterranean twist, but there’s dedicated Pizza and Pasta sections so even fussy eaters should find something to their liking. 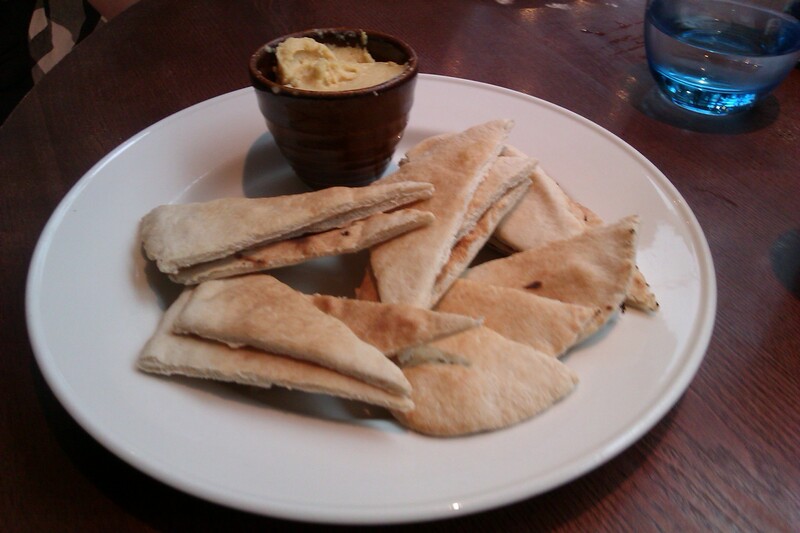 To kick off the evening, we ordered an appetizer of Hummus and Pitta Bread, which came in at a purse-friendly £2.95. When our budget appetizer arrived, we were pleasantly surprised to find there was more than enough to go around. This generous pot of tasty hummus and pile of warm pitta bread is the perfect, value for money pre-dinner nibble. A nice change from the usual bread-and-olive-oil starter, and highly recommended for a party. After gobbling up the hummus and bread, expectations were high. 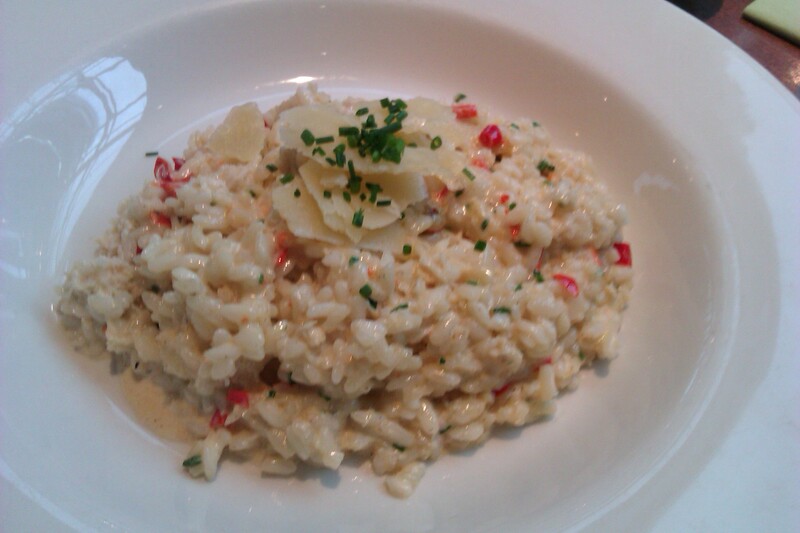 Could the mains live up to the starter? Our eyes lit up the second we spied the first main meal, a 14 inch Gamberetti pizza (£10.95) Not only was the pizza hanging off the plate (always a good sign!) 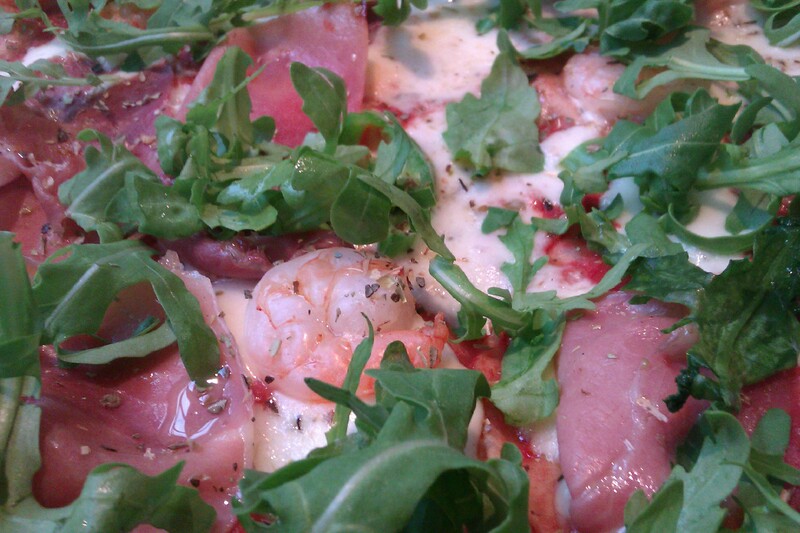 but it was completely coated in king prawns, green chilies, prosciutto and vibrant rocket. Quite possibly the best-looking pizza we’ve ever clapped eyes on. 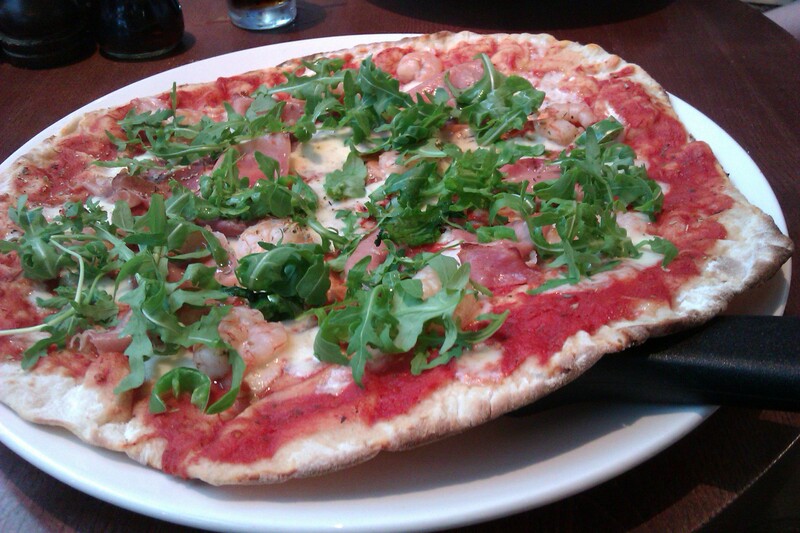 Restaurant pizzas can be on the salty side, and we did have our reservations about king prawns on a pizza, but Ego’s offering was the perfect balance of tongue-scalding chilies, salty prosciutto, meaty prawns and peppery rocket, mixed up with a rich tomato sauce and presented on a thin, crispy base. If you’re a pizza lover, then you owe it to yourself to try Ego’s Gamberetti – just do it on an empty stomach, because this is a real waistband-stretcher! Washed down with a crisp bottle of Marche Bianc (£14.95) and two diet cokes (£2.25 each) we were left completely stuffed, and won over by Ego’s classy ambiance and view. However, as we finished up paying our bill something strange happened. Throughout the meal the staff had been shifting tables around ready for the arrival of a large party next to us. This party arrived and squeezed into their allotted seats, but then an extra few party-goers arrived and, much to our surprise, two of the late arrivals sat down on the edge of our table, without so much as an explanation or an apology. Cue an awkward few minutes while we waited for our change, before we made a speedy – and rather confused! – exit. We were loitering outside Ego debating where to go for a nightcap when the manager rushed after us, apologising profusely and explaining that the extra people hadn’t made reservations, and they certainly hadn’t been told by the staff to sit at our table. 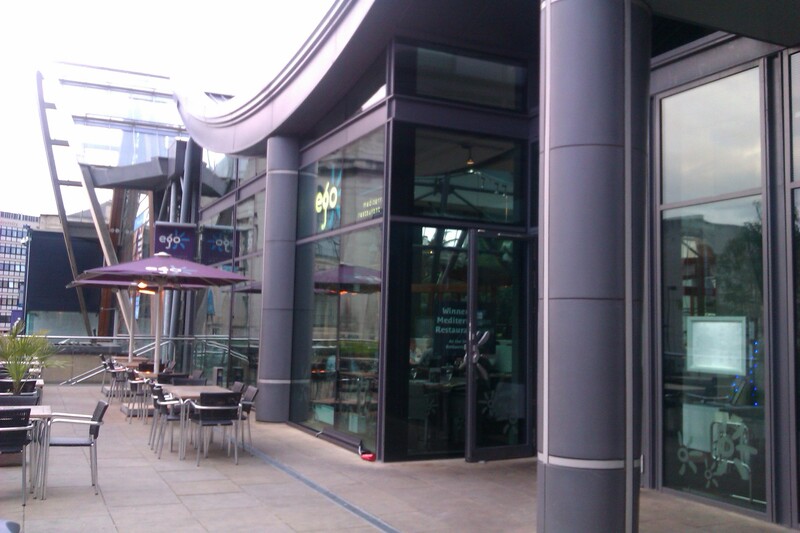 We were really impressed that the manager had taken the time to apologise, especially since we were already off the premises and the awkward situation was in no way the staff’s fault. More restaurants should take a leaf out of Ego’s book and we’d like to thank the staff for being so conscientious! All in all, Ego’s food is on par with the other fine city centre restaurants – expect cuisine in the style of the Leopold Square crew, but in a far more striking setting. This is a restaurant that’s out to impress with its decor and views, and can hold its own with the food, too. We left Ego absolutely stuffed and feeling that, for a bottle of wine, two meals and a starter in such a lavish, city centre setting, we’d got our money’s worth.